T-Mobile's marketing department has gotten all Ogilvy on us, and used its creative powers to come up with the 4G Pay Day game that involves $4000 daily giveaways, and the grand weekly prize of an Audi Q5. As usual with these games, it is text-message based, and requires you to send the most answers to a trivia game within an hour you are capable of, and then hope the others didn't know as much, or were just slower. Starting today, T-Mobile customers can text START to 4444 to review and accept the game rules and participate in the 4G PayDay mobile trivia contest. The game will consist of multiple-choice trivia questions delivered via text message. The goal of the game is to correctly answer the most consecutive questions within an hour. If players get stuck, they can choose to get a HINT to narrow their choices, or to SKIP that question to continue their winning streak and get a different question. (Both options are limited to three per game and cost $1.00 each plus tax). The game ends with one incorrect answer or by reaching the one-hour time limit. Each player can participate in three games per day. The player with the most consecutive correct answers in one game each day will win the daily $4,000 prize. The weekly Audi Q5 vehicle winner is determined by the most consecutive correct answers in a single game for the week. In the event of a tie, the most consecutive answers in the shortest amount of time will be declared the winner. Are you fond of these types of carrier games aiming to pad the bottomline? Then let us know if you managed to score that Audi Q5 smooth ride. 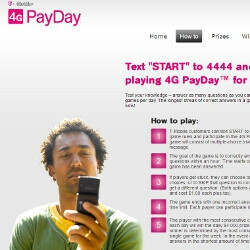 The T-Mobile 4G Pay Day game starts today, and will run until October 2nd. 63 consecutive questions answered correct right here lol... Hopefully nobody beats me. How long is this game going to be? Just July? I think it's awesome! It works great and then just stops. Have signal it just stops responding. And yes I did have the question right. over 10 minutes still nothing. If I had the question wrong it would have gone into the third game so that's not it. This game is ridiculous... takes forever for them to send me a response... and when they do they might say i am wrong and then send me another question for that same game.... How are you suppose to get lots of questions answered when it takes 5 minutes to get a new question! Rigged! I like it, it's fun! But i only had 33, and then something weird happened to the next 2 games....it was just my first game. I will beat all of u!!!! Mruhahahaha! I got stuck on one and lost it...*tear* I was having fun just seeing how many I could do. They should have a chart to show us the highest score in lead each day so I'm no like "Woot, I'm at 53 and still have a half hour to go" and then find out someone was way ahead of you." fyi the article is wrong in that the texting is free. they don't charge you if you do not have a plan and they don't use up the texts you are allotted in your plan if you do not have unlimited! I answer the question correctly, but it takes too long to send another. It tells me I didn't submit and forfeit. Or it tells me I got it wrong when in fact I know it is right. What a rip off! I have been playing and although I put in the correct answer it tells me my answer is wrong..... very annoying! For example if I pick "1" they say no sorry the correct answer is "1"'.... seriously??? It is definitely fun and I am learning some crazy facts, BUT sometimes it takes over 5 mins to respond to my answer and then it tells me my game is over. One time is ended my game saying my answer about a deck of cards was wrong...but I know I chose the right answer. There are 52 cards in a deck. I want to win but they are not being fair. yeah right........what type of phone do you have? I would have to say that 548 consecutive correct answers in 60 MINUTES via text messaging and waiting for an answer from t-mobile as to if you answered the question correctly would be utterly impossible. Unless of course you have some type of "special" phone that is more compatible with tmobile than anyone else may have and your answers and tmobiles response to your answers are sent and you recieve their response INSTANTLY. Also I would have to say you would be a TRUE GENIUS as well. I highly doubt all those factors I just mentioned are in your favor. Its a game, let's be honest. Dont waste space for accurate information when there are people who are really playing the game for a chance to win and are only reading this blog to find out TRUE info about this game. There always has to be one in the crowd though, it never fails. Just like one person at a job that makes it dreadful for the rest or one person in your high school class that makes that whole class miserable. You are obviously "ONE" of those peoople. Straight up ANNOYING!!!!! This game cheats. I either lose a connection suddenly, it'll send me a text saying sorry we are unavailable (during a game, particularly towards the middle to end) or my phone will suddenly freeze and it'll send in multiple answers, sometimes I'd answer correctly and it'll say I'm wrong when I know for a fact I'm right. A colleague finished and his phone froze and had to be restarted then said sorry you answered incorrectly even though his hour was up! Then they ask ridiculous questions that no one knows! Don't get your hopes up on this cheating *** game! It is fun though but frustrating. I advise you to only play for fun not for the awards. Hey I would like to say that its only possible to get around 44 questions anwsered in a hour max so if you'll time yourself you may have a good chance at winning. I got 24 of them correct on the second day of the game or maybe it was the first day oh good luck everybody I hope I win also. I don't believe anyone has gotten a score in the 400s, 500s, or 700's! Not possible! LMFAO!!!! That means you are answering/getting the questions at a rate of like 7-12 a minute! I don't think so! SMH!!! LIARS!!!! Anywho, our best is 164 right now! :-) Holla Tmobile 4gpd gamers!! And good luck! This Game is a RIP-OFF It needs to be reported.... During the trivia game I found a question that had incorrect multiple choice answers. the question is" in "Ratatoulle", the clock in linguini's house shows. 1=11:50 2=12:50 3=10:50 4=Hint 5=Skip The clock in linguini's house actually shows (7:08). its an analog clock with Hour hand being on the 7 and minute hand between 1 and 2. None of the multiple choice answers are correct!! Getting a hint costs $1 and skipping the bogus question all so costs $1!! not sure of how many other questions will leave no choice but to pay to skip or hint or losing the streak because the answer is wrong. WTHJFK I agree with you the same thing happen to me also......we at least should havea way of getting our money back I hate to say it or believe it but I believe its a scam or a problem with the company only because I spent money on a skip once I got the skip they sent me a message three times that read wrong answer that was your last game for today and I had 25 minutes left in the game ..i dont know I like the company have the my touch 4g they gave it to me for free when I got the contract with them and I had no deposit .try contacting the company thats what iam going to do or you could file an lawsuit.